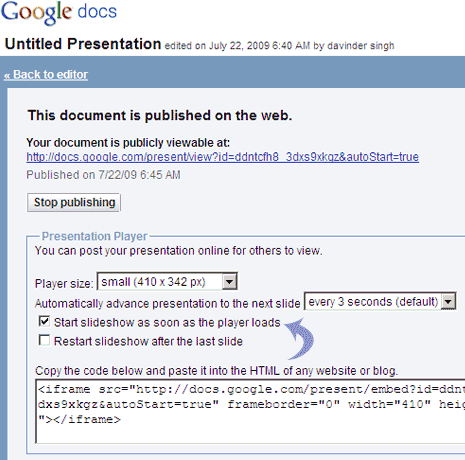 How to embed & show auto play Google Docs Presentation slideshow? 1. Click Share > Publish / Embed (located at top right while in presentation editor of Google Docs Presentation). 2. Select the player size and then select time after which presentation shows the next slide. By default 3 seconds is selected. 3. Tick or check option “Start slideshow as soon as the player loads” for auto play of slideshow. You can also select option “Restart slideshow after the last slide”.